The council are in process of putting together a Local Plan which they say will cater for the Borough’s housing and employment needs up to 2029. They have identified Stoneham Lane as their preferred location for 1300 new homes but council planners have also been flying around the Borough in helicopters looking out for further land that could possibly be redeveloped for housing or business use. In July a list of potential sites were published in a Strategic Land Availability Assessment. 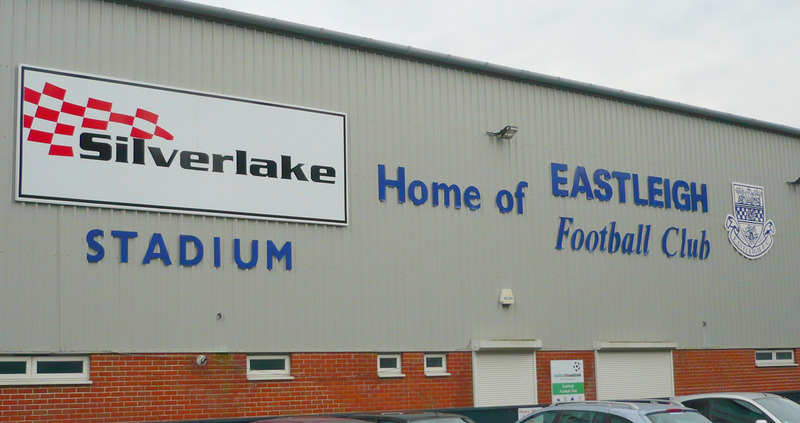 In addition to the Eastleigh FC site (which includes Wellington Sports ground) a number of other locations in the Stoneham Lane area have been identified including Doncaster Farm sports field, Jubilee Playing fields, Stoneham Sports club and the University playing fields. Eastleigh News believes the club has discussed the matter with the council and that land at River Side – formerly the Chickenhall Lane Pirelli works – has been mooted as a possible site for a new stadium now that Council plans to construct a business park with 9,000 jobs appears to have been binned. However any future plans are at this point are only speculation as the club has not responded to an invitation from Eastleigh News to comment on its future or its inclusion on the SLAA list. Tight lipped Spitfires press officer Malcolm Clarke was only able to confirm that the Club Chairman had been made aware of our inquiry. We think any possible move nearer to the Town Centre would be a good thing for the Town and the Club. What do you think? The Council is not promoting this site for development – quite the reverse as the Council sees land on both sides of the M27 as an important part of the gap between Eastleigh and Southampton. Obviously EBC doesn’t want to be contaminated by Southampton but does wants to develop it power House in Eastleigh borough! Ihe gap between Botley and Hedge End is less important as EBC is intent on building right up to the borders of these two settlements. Let’s have fair consultation and representation. I think the article makes it clear that the council has identified the site as having ‘potential for development’ which of course is different to ‘promoting the site for development’. Has the Chairman not been in for talks with you or Bernie then? Are you able to scotch that one?